Thaena is a Nord citizen of Winterhold. 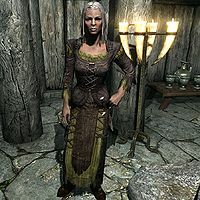 She is Jarl Korir's wife and housecarl, and the mother of Assur. She wears some clothes and a pair of boots. She wields an iron dagger, and carries a selection of common loot and gold. She wakes up at 7am, and wanders the hall for four hours, occasionally sitting in Korir's throne when he's away, only stopping to eat breakfast at 9am in the hall. At 11am she'll head to Birna's Oddments for a three hour visit. She'll then head home wandering the hall for the rest of the day, stopping for lunch at 2pm, and dinner at 6pm. She then finally heads to bed at 11pm. The only exception to her routine is if the Imperials take Winterhold; she'll move to Brunwulf Free-Winter's House where she'll stay indoors all day. She seems to share her husband's hatred for the College, saying things like, "Ours is the only family left that truly cares what happens to Winterhold." or "Korir will be the first to tell you that if it weren't for that College, we'd all be better off. I agree with him." or "Winterhold might yet thrive if that College had never been built." She may talk about the hardships in Winterhold, saying, "We do the best we can, even though we have next to nothing. But we Nords don't give up, not ever." She may also mention her son, saying, "Assur is going to grow up to be a great man, because he'll have lived through such hardship." Lastly, when the town is under siege, she'll say, "What's happening? What did you people do?" When she's exiled, she'll hatefully say, "I'd rather see the Sea of Ghosts swallow Winterhold entirely than have it run by the Empire." or "Without us looking out for Winterhold, it's doomed. Simply doomed." Korir: "Looks to be another cold day." Korir: "Not like this. Feels colder than usual. Bet it's those damned Mages." Thaena: "I'm sure you're right." Thaena: "That... wizard is still at the Inn. I can't believe Dagur allows him to stay there." Korir: "This is what it's come to. No one seems to care what they've done to our home." Thaena: "It's clear that memories are far too short." Korir: "And it's clear money matters more to Dagur than honor." This page was last modified on 27 March 2015, at 16:22.